The Safest, Softest Pad in the Water™! The Safest, Softest Edges in the Water™! Pricing per Sq. Ft. Contact Us! Custom geometric shapes and sizes! Custom-made edge padding for any location within your water park. CPSC certified. Custom-made aquatic "carpet" in custom lengths up to 25' and in thicknesses of 1/2", 1" and 1-1/2". Custom-designed aquatic "carpet" tiles in geometric shapes. They play an important role in water park safety by reducing and preventing abrasions and impact injuries. An important consideration in choosing a landing pad is not only a pad's ability to resist becoming a breeding ground for fungi and bacteria, but also to be safely mounted without the use of metal bolts or screws that will rust or cause injury. Nylon surface anchors, commonly referred to as bantam plugs, can crack from repeated impact, resulting in the pad loosening, shifting and potentially becoming a safety hazard. 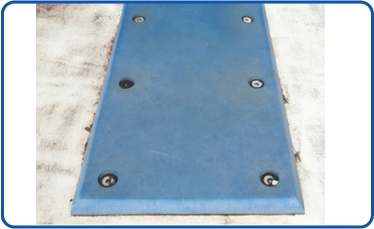 Commonly used landing pads are constructed of several layers of laminated foam glued together on top of a thin PVC base. The entire pad is then wrapped in a layer of vinyl pool liner material. Repeated impact results in a breakdown in the foam's density, causing the vinyl to peel away at the edges and cracks to form. Traditional pads discolor over time. 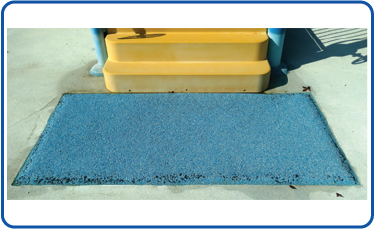 AquaticPads™ products retains color and non-slip properties. 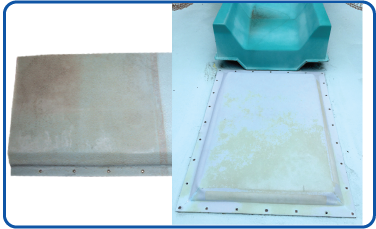 AquaticPads™ products are installed without unsafe external fasteners that loosen and rust. AquaticPads™ products are warranted against cracking, peeling and loss of foam compression. AquaticPads™ products are not constructed with pool lining that will crack and peel with repeated use. AquaticPads™ products are a single unit. No moving pieces or parts that will crack with repeated impact. AquaticPads™ products are available in an unlimited number of AquaPebble® color combinations. Offer applies to standard sized pads in Aquatic Blue color blend (as shown). No moving parts! AquaticPads™ products are single units comprised of a high density foam pad encapsulated in AquaPebble™ polyolefin pebbles that are hermetically sealed. 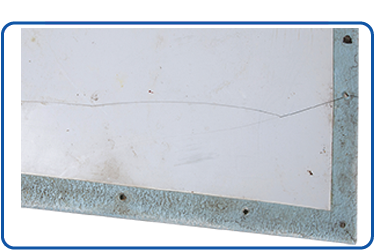 SlidePad® will not disintegrate, deteriorate, crack, fade and will not shift or move after being bonded to the surface. Use at the end of slides, pool bottom and any area that requires a slip-resistant, soft, safe landing. Use below the water's surface, indoors or outdoors. Unlike competitor's products, SlidePad® does NOT require external fasteners, screws or anchor bolts that compromise the safety of your guests. SlidePad's™ beveled edges prevent tripping. Airtight construction means that no maintenance is required! AquaticPads™ products are not only resilient to impact but chlorine-resistant, UV-resistant, hygienic, fungistatic and slip-resistant despite repeated use. Quick and easy installation! No bolts, screws or fasteners. Drilling into your pool's floor to install anchor mounts isn't necessary. 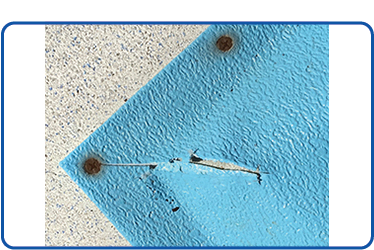 SlidePad® adheres to any prepared surface using SlidePad® Adhesive. SlidePad® will not detach and float to the surface and can be installed by your staff or one of our certified technicians. AquaticPads™ products are constructed to your specific measurements and are available in an unlimited number of color combinations to match the theme of your water park. Custom shapes are also available. 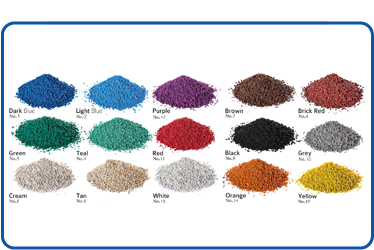 Polyolefin pebbles are environmentally safe and 100% recyclable. The clear, chlorine-resistant flexible coating hermetically encapsulates the entire pad, making it water tight and impervious to mold and mildew growth inside the pad. 3-Year warranty against cracking, disintegration, fading, foam compression and loss of slip-resistant properties.